The only useful data you’ll ever find is already digitized, but a surprising number of gauges and meters are still analog. The correct solution to digitizing various pressure gauges, electric meters, and any other analog gauge is obviously to replace the offending dial with a digital sensor and display. This isn’t always possible, so for [Egar] and [ivodopiviz]’s Hackaday Prize entry, they’re coming up with a way to convert these old analog gauges to digital using a Raspberry Pi and a bit of computer vision. The idea behind this instrument digitizer isn’t to replace the mechanics and electronics, as we are so often wont to do. Instead, this team is using a 3D printed bracket that mounts a Raspberry Pi and camera directly in front of an analog gauge. Combine this contraption with OpenCV, and you have a device that’s just smart enough to look at a needle on a dial, convert that to a number, and save it to a file or send it out over WiFi. It’s an extremely simple device for what [Egar] and [ivodopiviz] admit is a relatively niche application. However, if you only need digital measurements of an analog meter for a month or so, or you don’t want to mess up your steampunk decor, it’s an ingenious build. [BF38] bought a mid-range miniature drill-press, and discovered that it was just too short for some of his applications. “No problem,” he thought, “I’ll just measure the column and swap it out for a longer one.” It sounds foolproof on paper. He discovered, after having bought a new 48.3 mm steel column, that the original was 48 mm exactly in diameter. He’d have to make it fit. But how do you bore out a 48 mm diameter hole, keeping it perfectly round, and only increase the diameter by 0.3 mm? A file is out because you’d never get it round. A lathe is out because [BF38] doesn’t have a lathe. [BF38] ended up making a DIY honing head, which is a gadget that presses (in this case) two pieces of sandpaper evenly against the sides of the hole to be widened. The head in question is a little bit rough — it was made as a learning project, but it looks like it served the purpose admirably. This weekend is the Vintage Computer Festival East in Wall, New Jersey. Every year is different, but there’s a general plan for each day. On Saturday and Sunday, the exhibits rule the con, the consignment shop is busy, and the keynotes bring down the house. Friday is a little different. 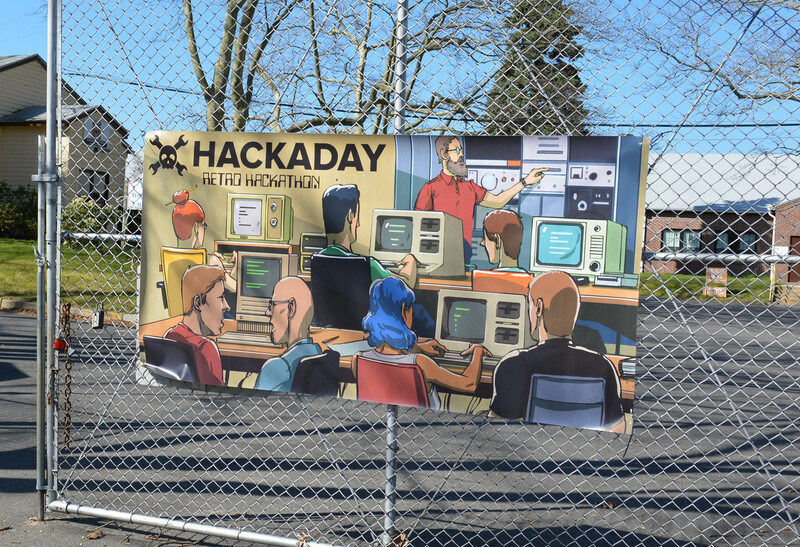 This is the day for ‘in the trenches’ talks from the commodore crew, classes on recapping 30-year-old computers, and this year – for the first time – a retro hackathon. It’s basically the same format as any other hackathon, but instead of bringing MacBooks and building something cool, Apple IIs and Commodore 64s were provided. This is the report on the first retro hackathon we’ve ever been to. First off, no one remembers how to program in BASIC. If you’re looking for a population that should remember the vagaries of the different dialects of BASIC, you would think it would be the people who came out to the middle of Jersey on Friday to talk about old CPUs. Apparently, this is not the case and several people were confused about single and double quotes in PRINT statements. Luckily, a few programming manuals for the C64 and Apple II were available, so everyone could still have fun with PEEKs and POKEs. If you want to get people programming on some old machines, you need to give them some inspiration. The first half hour of the retro hackathon didn’t see any teams programming. Given this demographics proclivity to say, ‘I can do that better’, I typed a few BASIC one-liners in the C64 (random Truchet tiles in PETSCII) and Apple II (a SIN graph), and the people started pouring in. Yes, they could program something better than a single line of BASIC. Sound on an Apple IIc. 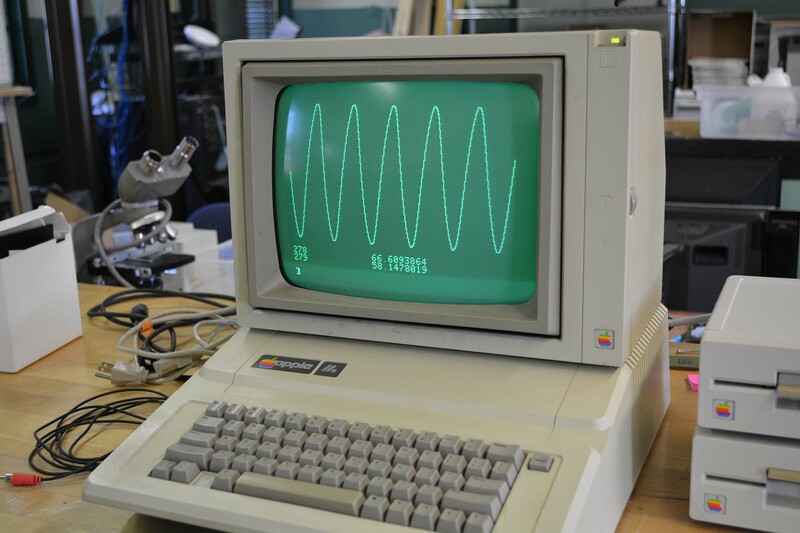 What came of an impromptu retro hackathon? Hangman, in BASIC. No, it didn’t quite work, and there were only three or four possible words hardcoded into the program. Still, text mode graphics are a lost art. The Apple IIc was programmed to make fart noises. The original plan for this project was to program music. What would have been the winning entry was a line-drawing program on the C64 that looked like the enemy in Qix. That guy wasn’t there during judging. The winner of a $50 credit to the consignment shop was a kid who programmed zero-player Pong on Apple II basic. He bought a Mac Portable (non-backlit) with that prize. We’ve gone to hackathons, we’ve waded through the sea of MacBooks, and had a Red Bull drip installed. This retro hackathon was completely different, but somehow familiar. No, no one is going to create something new – everything that can be done on these machines in a few hours of BASIC programming has already been done. That’s not the point, though. It’s a geek pride of proving your mettle, putting your money where your mouth is, and doing it in a casual environment where everyone is friendly. This is the first retro hackathon we’ve gone to, and it won’t be the last. We’re going to do this again, once we get an Apple IIc+, a few Commodores, a Speccy, and a few good monitors. We already have the banner, anyway. 3D scanners don’t have to be expensive or high-tech because all of the magic goes on in software. The hardware setup just needs to gather a bunch of cross-sections. In perhaps the lowest-tech of scanners that we’ve seen, [yenfre]’s GotMesh scanner uses milk. Specifically, the apparatus is a pair of boxes, one with a hole drilled in it. You put the object in the top box and fill it with milk to cover the object. A camera takes pictures of the outline of the object in the milk as it drains out the hole, these get stitched together, and voilà. There are limitations to this method. The object gets soaked in milk, so it won’t work for scanning sand-castles. (It’s optimally suited for chocolate-chip cookies, in our opinion.) If the camera is located directly above, the objects have to get wider as the milk drains out. You can do multiple takes with the object rotated at different angles or use multiple cameras to solve this problem. The edge-detection software will have issues with white objects in milk, so maybe you’ll want to scan that porcelain figurine in coffee, but you get the idea. More seriously, the rate of milk drain will slow down a bit as the amount of milk in the upper box decreases. This could also be handled in software. In all, we’re not surprised that we don’t see commercial versions of this device, but we love the idea. It’s based on this experiment where they dip a guy in a tank of ink! If you just drank all your milk, but still have a line-laser lying around, maybe this build is more your speed. What’s your cheapest 3D scanner solution? If you just want to prevent your garden from slowly turning into a desert, have a look at the available off-the-shelf home automation solutions, pick one, lean back and let moisture monitoring and automated irrigation take over. If you want to get into electronics, learn PCB design and experience the personal victory that comes with all that, do what [Patrick] did, and build your own ESP8266 based irrigation controller. It’s also a lot of fun! [Patrick] already had a strong software background and maintains his own open source home automation system, so building his own physical hardware to extend its functionality was a logical step. In particular, [Patrick] wanted to add four wirelessly controlled valves to the system.